Looks like moisture in the air for this evening and early into tomorrow. Tomorrow’s showers looks like them might be our of here by 8:00-9:00 a.m. By noon or so, it should be partly cloudy skies and temperatures in the upper 50s. Tuesday will be the coolest day of the week in the low 50s. Upper 50s Wednesday and then upper 60s to low 70s into the weekend. The following week has showers popping up again. That’s a ways away! Non-stop generation. However, it has slowed down some since Thursday afternoon. Not quite as much flow, but still more in the mornings that is good wading water. If the projection is correct for Monday, we will see the 35 mwh level which only takes the water up a couple feet or less and this provides several areas where one can wade. Gina on the water Thursday with Brian from Iowa. After catching some fish on the ruby 2 under a peach egg and stripping the tiger tail, Brian wanted to work on improving his casting. Gina took him through the program all the way from the roll cast to throwing the sinking line. Thursday, Stan took Larry, from Kansas out for a half day trip. Larry had so much fun, he went out again with Stan on Friday. Most of the fish were on the ruby 2 under the big ruby. Two nice, warm days. Only negative was a little bit of extra wind! 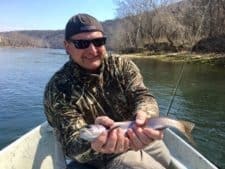 This entry was posted on Sunday, March 18th, 2018 at 4:32 pm	and is filed under Fishing Reports. You can follow any responses to this entry through the RSS 2.0 feed. You can leave a response, or trackback from your own site.